As an Internet Service Provider, back in the "56k dial-up modem access" days, and having personal working knowledge of running mail servers over the past 20 years, I can certainly relate to Brian's book. I've been on the cutting edge of fighting spam and I am still constantly tweeking my mail servers today. I had no idea of who these "spammers" are, what their motives are, or how many people actually buy that stuff. I do know that they have been a thorn in my side for many years, costing me a lot of time, money, and effort. Brian's book is not a technical book for nerds only. It goes into detail, describing in plain language, about how spammers control an army or "bot net" of infected computers and routers to both send out billions of spam messages and carry out Denial of Service (DoS) on each other or as a service for hire. Brian shares some of the actual communications that he has had with these big time spammers, and his trip to Russia to meet one of them in person! If you are like everyone else who has been peppered with messages about pharmaceuticals, body part enhancements, and various scams to take your money, then Brian's book will at least help you to "Know the Enemy." After reading his book, I checked out his blog site http://KrebsOnSecurity.com and found a wealth of the most current information about the latest activity in the criminal underground. Last night at around midnight, I went to his site and read his breaking story about the hacking at Anthem where millions of people's personal information was stolen. Brian has a better understanding of what is going on in this criminal underworld than anyone I have known or read about. 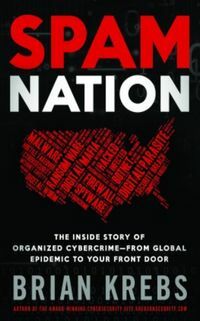 Brian's book, Spam Nation, along with his blog site, is what inspired us to come up with our America Only Internet feature for Tomato Routers that I wrote about in an earlier blog post. One of the common threads with all these hackers is that they usually involve your computer or server communicating with an overseas IP address. Spam Nation is entertaining as well as educational. I highly recommend picking up a copy from Amazon.com, either in paperback or Kindle version. I read the Kindle version which cost about $9.50. I look for this book to be on the best seller list for quite a while.